A “national sanctuary,” an “oasis of freedom” would be the perfect description of a Russian dacha and a tradition to go out of town for the weekend. The vast majority of Russians, especially those living in large cities, enjoy making weekend trips to their country houses known in Russia as dachas. A well-known German journalist, Boris Reitschuster, shared his impressions of Russian dachas with Germany’s Bunte magazine. According to the journalist, only a foreigner would think of such inconveniences as a toilet across the garden, swarms of mosquitoes, or a bucket of ice-cold water instead of a fine shower. “In all sincerity, I have to admit that even an ardent adversary of the dacha lifestyle may become disappointed in their previous beliefs, the journalist, who resides in Russia for years, wrote. About 60 percent of Muscovites prefer to spend their weekends out of town in summer. A Russian dacha is not just a summer residence. It is a lifestyle. Those Russians, who ignore this way of living, often have to face critical issues, Olga Vainstein, a researcher of Russian culture believes. It seems that many fans of the dacha lifestyle see the world divided into two different categories: dacha dwellers and losers. Adversaries do not see a point in dedicating their weekends to hours of traffic jams for the sake of just one day of fresh air out of town. The distance between the city and the dacha may vary from 1 to 1,000 kilometers. Nevertheless, summer residents are fully prepared to overcome all obstacles to spend a week out of civilization. The daily city noise, the view of multi-storeyed apartment buildings, the overcrowded metro and streets can be very depressing indeed. Dacha is a whole new world which gives Russians a taste of personal freedom and unity with nature. Dacha gives an opportunity to get enough sleep, to enjoy a hammock, a lovely lunch underneath apple trees, or to spend long and warm summer nights singing songs in a company of friends. “People used to feel free on their dachas in Soviet times,” Olga Vainstein believes. Many Russians use their dachas to store their old furniture, clothes and a great deal of other things there. Dacha has become a sanctuary of alternative culture. 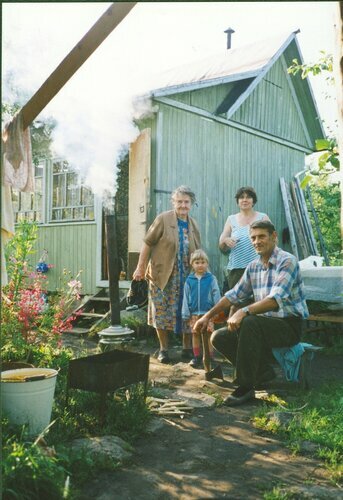 Each Russian dacha, no matter how big, gorgeous or tiny and poor it may be, has its own piece of summer nature. Millionaires adorn their terraces with fashionable marble plates to put up a good show for neighbors. Common people usually grow vegetables on their dachas to make jars of pickled tomatoes and cucumbers for a long Russian winter. Unlike in Western countries, Russian summer residents may visit their dacha neighbors for a cup of tea or a glass of something stronger without any invitation. An invitation to come to the dacha is considered highly important in Russia. A person who receives such an invitation becomes a family member to a certain extent. It is considered highly impolite to turn such a request down. Even those who hate dachas have to admit that Moscow becomes easier to live in summer because tens of thousands of people leave the capital to enjoy their dachas. When I was young and living in the New York City metropolitan area, it was traditional for families poor or rich and everything in between to leave the city for part of the summer, sometimes all of it sometimes just a week or two and head off to a small rented cabin by a lake, up to New England somewhere, to the lake districts in upstate New York, or to a small wooden shack on the beaches in Connecticut. Of course the breadwinner would stay in the city and work, sometimes driving for a few hours to stay with the family on the weekends. This is not done much anymore, if at all. Most of the old cabins on upstate lakes and shacks on the waterfront areas have been turned into very high priced private condominiums or private fishing or golfing communities for the very well off. But I am glad to see the same sort of thing is still alive and well someplace in the world.